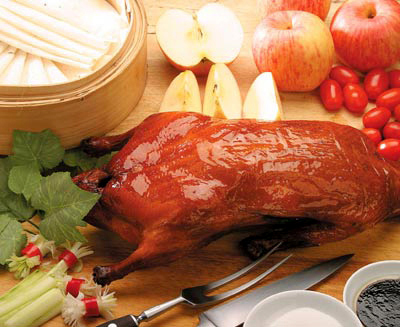 Peking Duck, or Peking Roast Duck, is regarded as one of China's national foods. Having been prepared since the imperial era, the dish is prized for its thin, crispy skin sliced in front of the diners by the cook. The art of roasting ducks evolved from techniques used to prepare suckling pigs. For more than a century, specialized chefs have developed the idea that the skin of the duck should be so soft and crisp that it melts in the mouth. Only the wood of fruit trees such as date, peach and pear are used in the roasting process to give the meat its unique aroma. The two famous Beijing condiment shops, Liubiju and Tianyuan, supply the dark tangy bean sauce spread on the pancakes. The fragrant sesame oil and refined sugar are also specially selected.